April 22, 2019 – Press Release – Public Invited to Meet Artists at Kiwanis Pancake Breakfast. See Full Story. April 12, 2019 – Press Release – The City Center Partnership is excited to commence phase II of INFUSE: Artists on Main Street Mankato, a partnership between the Preservation Alliance of Minnesota and Springboard for the Arts with support from the Bush Foundation. See Full Story. April 10, 2019 – Press Release – Early in the morning on Saturday, April 20, volunteers will remove the current sculptures to prepare the bass for the ninth installation of the public art tour. See Full Story. September 15, 2018 – The Free Press – A day of art-related events in Old Town coincided with the Old Town Art Fair. See Full Story. August 9, 2018 – The Free Press – Although it’s August…summer isn’t over yet. See Full Story. July 24, 2018 – Mankato Magazine – Whether it’s sculptures or murals, Mankato is a bastion of public art. See Full Story. May 7, 2018 – KEYC – The time for observing beautiful art in the city has returned! See Full Story. May 2018 – Twin Cities Business – A special report on how the city’s growing economy is attracting businesses at the fastest rate in decades. See Full Story. 3.18.18 – The Free Press – After together creating art that has been featured in sculpture tours across the state, two teachers collaborated to create a new class at Janesville-Waldorf-Pendleton High School. See Full Story. 3.1.18 – KEYC – Megan Flanagan with the City Center Partnership joined KEYC News 12 This Morning to talk about Mankato being selected as an Artist on Main Street community, what it means for the City Center, and upcoming events in Mankato’s City Center. See Full Story. 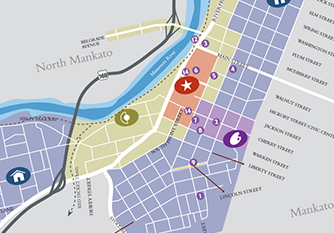 2.27.18 – The Free Press – The Old Town neighborhood will be getting a little more vibrant, thanks to an arts-centered pilot project as part of Mankato’s Minnesota Main Street Community designation. See Full Story. 1.23.18 – The Free Press – Curious fans of Mankato’s creative community filled the Twin Rivers Council for the Arts gallery to check out the city’s latest strategic plan to support and promote the arts. See Full Story. 11.15.17 – The Free Press – Mankato has become the eighth historic Minnesota town to be designated a Main Street Community through the Preservation Alliance of Minnesota. See Full Story. 7.24.17 – The Free Press – Under a master plan for Belgrade Avenue, the city of North Mankato could see more mixed-use buildings, intersection bump-outs and even an expansion of its central business district. See Full Story. 2.28.17 – MSU Reporter – Niche shops channel the energy of Mankato downtown’s traditional beginnings. See Full Story. 2.25.17 – KEYC – Members of the community gathered to discuss the arts and culture of Mankato. See Full Story. 2.5.17 – The Free Press – A New 10-year arts and culture plan is being developed over the next six months. See Full Story. 1.26.17 – The Free Press – North Mankato residents had their first chance to weigh in on the future of Belgrade Avenue. See Full Story. 1.24.17 – The Free Press – North Mankato officials would like public input on potential safety improvements to the Belgrade Avenue corridor. See Full Story. 11.19.16 – The Free Press – Small Business Saturday encourages shoppers to hit locally owned businesses. See Full Story. 05.07.16 – The Free Press – CityArt Mankato is getting ready to introduce the 2016 Walking Sculpture Tour. See Full Story. 04.03.16 – KEYC – This year’s sculptures will be taken down on April 9. See Full Story. 2.19.16 – The Free Press – Should the City have an arts and historic district? See Full Story. 1.26.16 – The Free Press – More than 100 community members came together to discuss the future of Old Town. See Full Story. 4.29.15 – The Free Press – The 2015 lineup for the popular Alive After Five music series has been announced. See Full Story. 4.24.15 – The Free Press – Area bikers and drivers will see an increase in the number of bike lanes in Mankato in coming years, with the first phase beginning in the City Center core. See Full Story. 4.13.15 – The Free Press – New project will bring price tag for recent upgrades to nearly $40 million. See Full Story. 3.28.15 – The Free Press – Editorial column on the soft and hard rewards of the downtown connectivity project. See Full Story. 3.16.15 – The City Center Partnership is seeking public input to help shape City Center neighborhoods and districts into vibrant public spaces. 3.13.15 – The Free Press – Patti and Katie Miller accept a posthumous Volunteer of the Year Award for their mother Ann Vetter, and unveil a bronze sculpture their mother commissioned before she died last year. The sculpture will be installed in the City Center this spring. See Full Story. 3.2.15 – The Free Press – Changes coming to Mankato’s civic center have been finalized and include a 2,100-seat concert space, better facilities for MSU hockey teams and some features aimed at brightening up downtown. See Full Story.